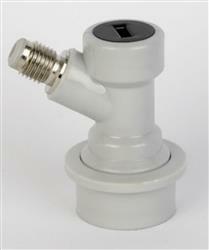 These ones have a MFL screw thread on them, we also have barbed ones to attach to gas line or beer line. 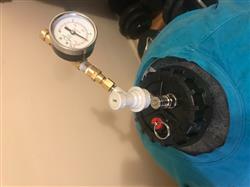 The grey (gas) disconnect attaches via a swivel adapter to our mini regulator and fits onto gas posts (marked with a line) on either the "Missionary" or "Double Ender" spears and carbonation caps. The black (liquid) disconnect attaches to the MFL tap shank adapter for connecting a tap to the liquid post of the "double ender" spear. The black disconnect can also be used to attach gas to the liquid post in order to force carbonate home brew more quickly. The disconnects are good but having trouble seating them on the fermentasaurus when doing a transfer to the keg. Not sure why it doesn't sit on correctly, needs to be held down manually. Works great, makes switching my regulator between kegs so quick and easy.